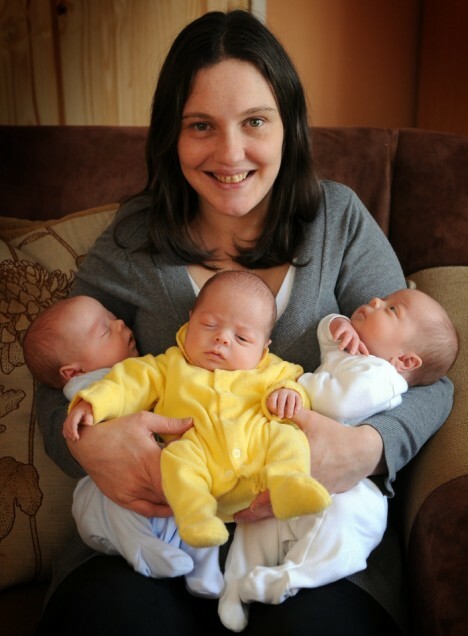 A UK mom has beaten odds of one in 160,000 by giving birth to naturally conceived identical triplet boys. Emma Spooner, 28, gave birth to Alfie, Sebastian and Zak last month, but only learned that the triplets were identical on Friday after a test on the placenta. Even though the triplets arrived at 34 weeks gestation, the hearty three only needed to stay in hospital for eight days before going home. The whole family has been helping to look after the boys, including Emma’s mother, Diane Raymond, and stepfather Doug, who stayed for the first two weeks after the triplets came home. The triplets join the couple’s two other children Molly, eight, and Jacob, five, to make a very full house! Identical triplets occur when one fertilized egg splits to create three separate embryos. Non-identical triplets occur when three separate eggs are fertilized. The Multiple Births Foundation estimates that triplets occur once in every 10,000 naturally conceived births, but the odds of identical triplets are 150,000 to 160,000.